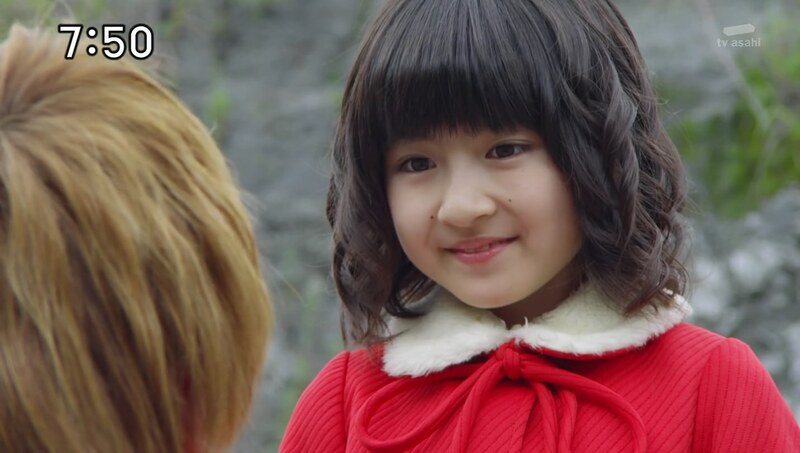 Recap: Mahou Sentai Magimagiger, Episode 38 – "The Little Witch Loves Yakumo?" Fuuka, Nagi and Takaharu join Kasumi in the living room as she’s looking through a catalog showing clothes for Ninja Coming of Age Ceremonies which ninjas go through on their 20th birthday. Today though, it’s basically an opportunity for families to take pictures. 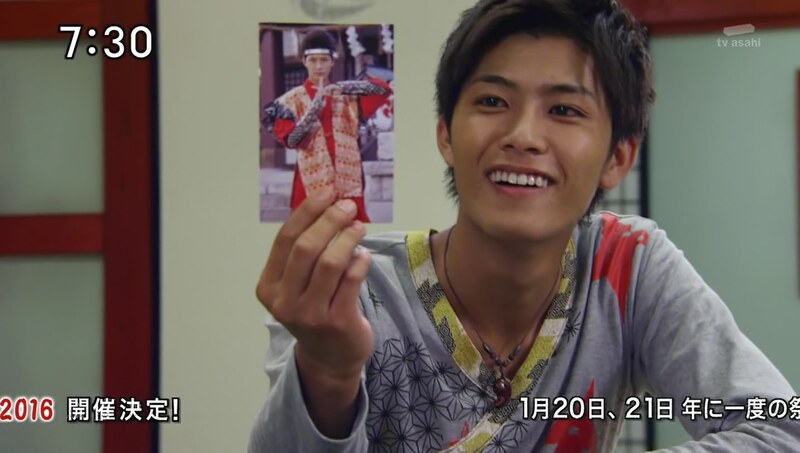 Takaharu shows them his photo since he’s already gone through it. Kasumi says Yakumo will go though the ceremony at the same time as her. Yakumo is walking home, also looking through the catalog, wondering which outfit is best for a magic ninja. He suddenly hears screams and thinks it’s the Kibaoni. But actually it’s a little witch on a broomstick. Whom he knows! Yakumo undoes her spell in which she has two guys flying up in the air for stepping on flowers. This little girl is Elena and she runs over to hug Cloud. He tells her magic shouldn’t be used to prank people. But more importantly, why is she in Japan? She says he hasn’t been back in a long time, so she came to visit him. 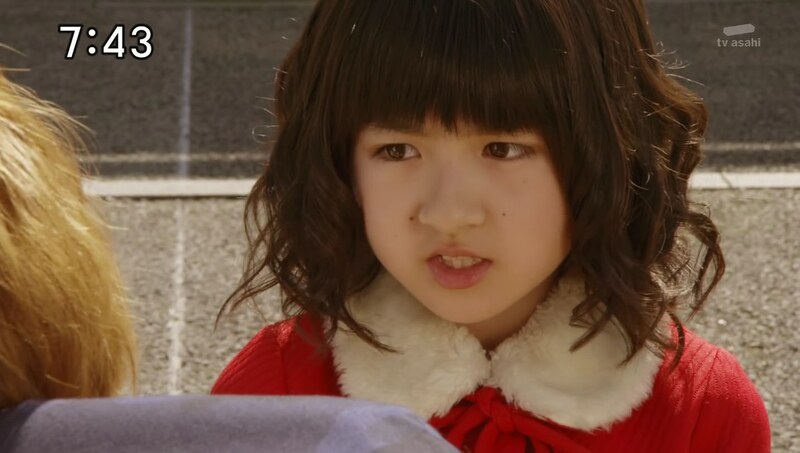 And she hopes to meet his Mahou Sentai teammates whom he’s written to her about. Cloud quickly runs home and waves his wand to change the dojomanse into a magic mansion, much to the surprise of the cuzzos. He says he’ll explain later and welcomes Elena in. He introduces her to them. 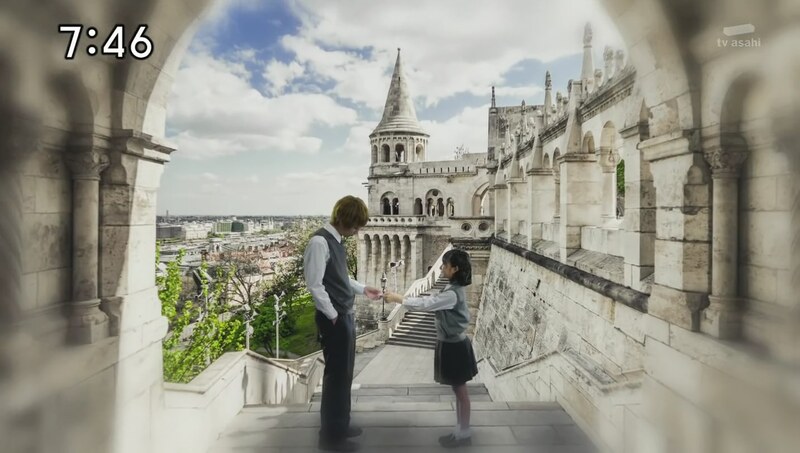 Elena is the daughter of his magic academy headmaster. Elena tells the cousins they look pretty boring for wizards. The cuzzos have no idea what’s going on, so they drag Cloud out of the living room. He says this is “not easy” and to just play along as wizards while Elena is in Japan. Father walks in and Elena makes him fly through the air. She says she’s excited to see what the cousins can do too. They head outside. 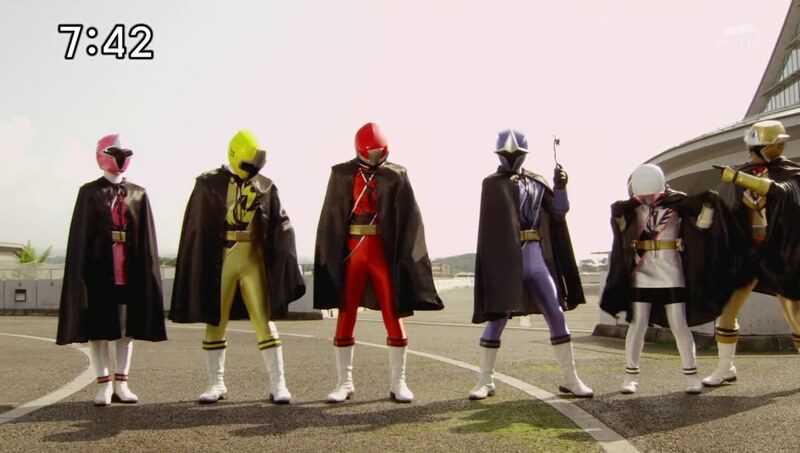 Takaharu, Kasumi, Nagi and Fuuka are dressed in black robes. 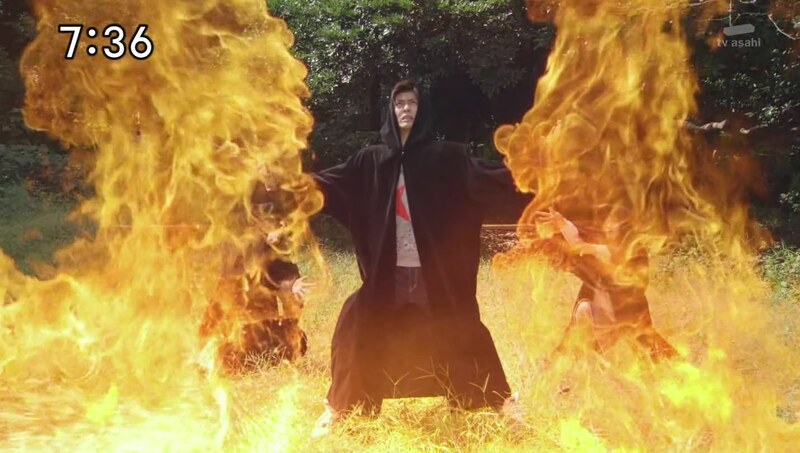 Takaharu goes first and pretends to cast a spell while Kasumi is behind a tree and uses Ninpou to fulfill the fake incantation. 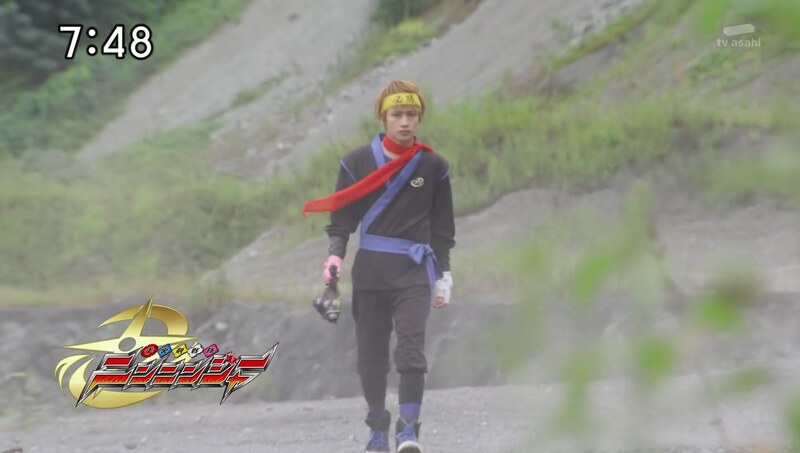 Kinji walks out of the bushes, dressed in his normal training outfit, excited to join in the training. He is about to use Ninpou, but Takaharu and Nagi stop him. Fuuka and Kasumi try to redirect Elena’s attention. She says she’d like to go shopping and Cloud offers to take her. Meanwhile, Ariake no Kata continues to be very weak and needs much fear energy. A Hyakkarage whispers to Masakage who is shocked and says this is an emergency. They need to collect fear right this minute. Back downtown, Cloud and Elena have fun shopping and enjoying treats together. It’s very… romantic?! They pass by a wedding and Elena says she hopes she’ll be a bride very soon. Cloud says she’s too young. They head to nearby benches and Cloud offers to buy her some drinks. While Cloud is gone, she notices the ninja catalog in Yakumo’s bag. When Yakumo returns with the drinks, Elena asks when he’ll return to England to continue schooling. Not for a while, he says as the Gamagama-jus perk up. Swiss Army knife Yokai Amikiri is ramping at the wedding chapel from earlier, snipping at things precious to different people including a little boy’s toy car and the bride’s pearl necklace. Masakage leaves to quickly bring the fear to Ariake no Kata. Cloud and the others arrive to face Amikiri. They are about to henge, but Elena comes running. They can’t go ninja, so Cloud says they go magical. Time for a Mahou Henge. Cloud waves his wand as they henge and they become ninjas with capes! 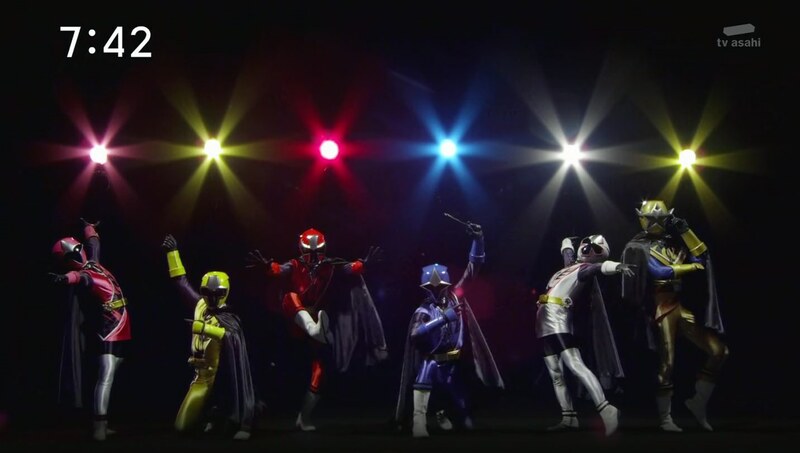 Mahou Sentai Magimagiger! Cloud uses his magic. But Amikiri just snips at his wand and forces him to dehenge. 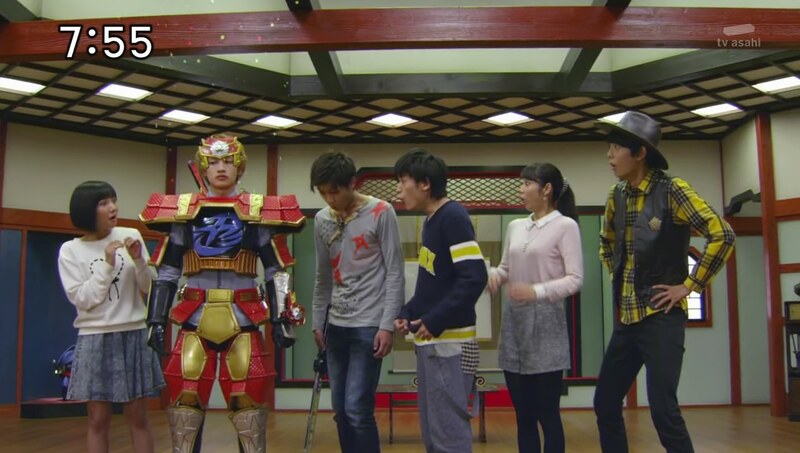 Takaharu tries, but Amikiri cuts his Ichibantou in half and also forces him to dehenge. Elena runs over to Cloud. Kasumi says they have no choice but to use Ninjutsu. 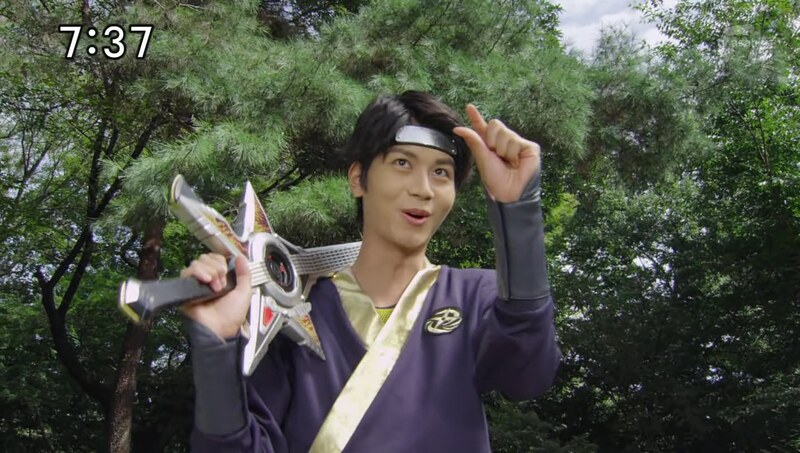 Kinji agrees. Together, they use Cloning Technique and Chain Technique. Elena asks about Cloud’s status as a wizard and calls him a liar when he tries to explain. She runs off. Just then Amikiri breaks free of the chains and jumps over to grab Elena. Elena drops her wand. Amikiri sees Elena means something to Cloud and is about to cut her in half. But Masakage arrives and says they can use Elena to their advantage. He asks Cloud to hand over their Nin Shurikens at dawn to save Elena. They disappear. Cloud picks up Elena’s wand. 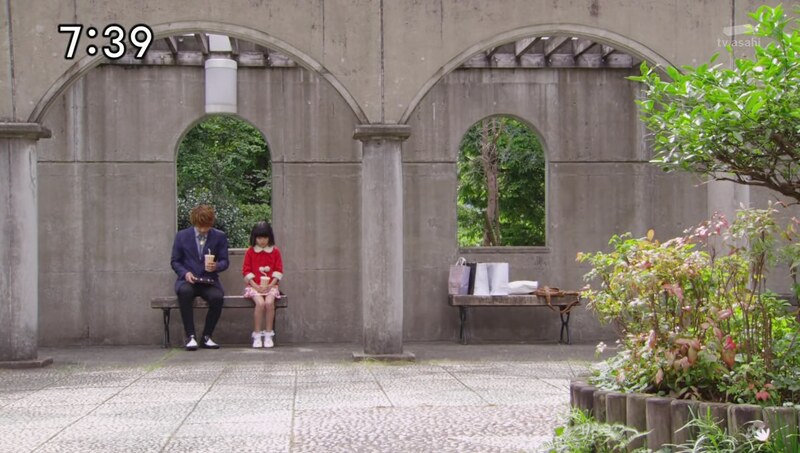 Back at the dojomanse later that night, Yakumo spends time alone thinking about the moments with Elena. He is about to run into battle, but his cousins stop him. This is not like Cloud to act so rash. Kasumi says none of this would’ve happened if Cloud told Elena he was a ninja from the very beginning. Why did he do it anyway? Cloud explains. When he was at the academy, Elena gave him a love letter in which she declares they will get married once he becomes a full-fledged wizard. Kasumi says this is just something little girls do. Cloud says he can’t ruin Elena’s dream. Fuuka says wanting to protect a girl’s dream is amazing and she excitedly wants to support him. Kasumi, Nagi and Kinji hesitantly nod in agreement. 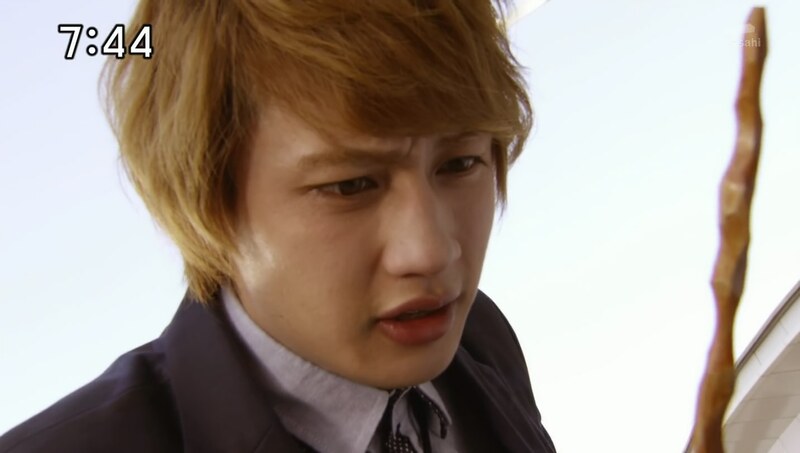 But Takaharu reminds Cloud of the time he said they should always all work together as a team. The cuzzos hand Cloud their Shurikens. At dawn, Cloud goes to meet Masakage and Amikiri. He is wearing white and pink gloves, a red scarf, a yellow bandana and a Western badge. Masakage commends him for being honest and coming alone. Cloud tosses the bag of Shurikens to Masakage and demands to return Elena. But Masakage says of course he’s not going to keep the end of the deal. Jukkarage surround Cloud. But Cloud tosses all his accessories into the air. Turns out the accessories were just the cuzzos in magical form. They take out the Jukkarage. 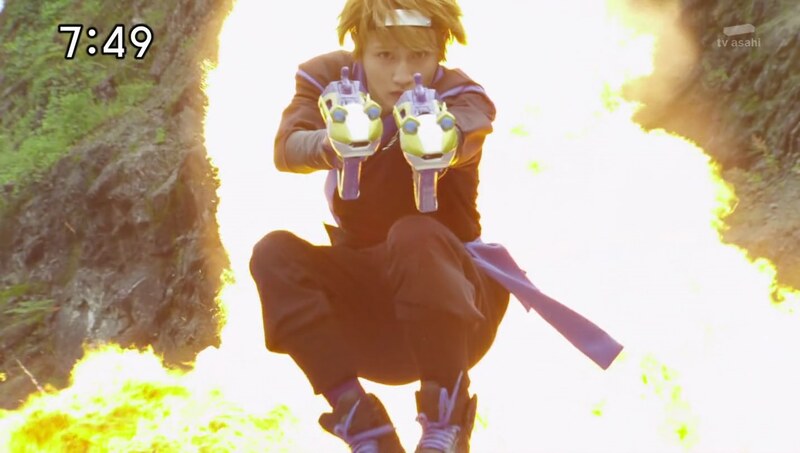 Cloud takes Takaharu’s Gamagama-ju and his own and shoots at Masakage to get the bag of Nin Shurikens back. He then high kicks Amikiri and saves Elena, taking her to the top of the cliff. Cloud says he may be a ninja, but he’s still a wizard. He’s a magic ninja. Cloud hands the Nin Shurikens to his cuzzos and tells Elena to get to safety. They henge and Kinji hands Takaheru his Gekiatsuto to use for now since his Ichibantou is still halved. Amikiri calls some Jukkarage over and the Ninningers fight them. Back on the cliff, Elena is startled when Jin Masato is back from the dead! her Tsubasa-sensei appears. He’d been tasked with looking for her. But it’s okay. He is looking forward to seeing his pupil Cloud in action. Tsubasa tells Cloud to show him just what a magic ninja can really do! Cloud uses Mahou Ninpou to deliver a big blow to Amikiri. That excites Shishi-Oh who pops up to Cloud’s wrist and allows him to go Chozetsu. With a magical lion-dragon combi, Cloud finishes off Amikiri’s first life. A Hyakkarage whispers some huge news to Masakage who says he must hurry back immediately. He embiggens Amikiri and leaves. The Ninningers quickly hop into Ha-Oh Gekiatsu Dai-Oh and take care of Amikiri. Too easy. 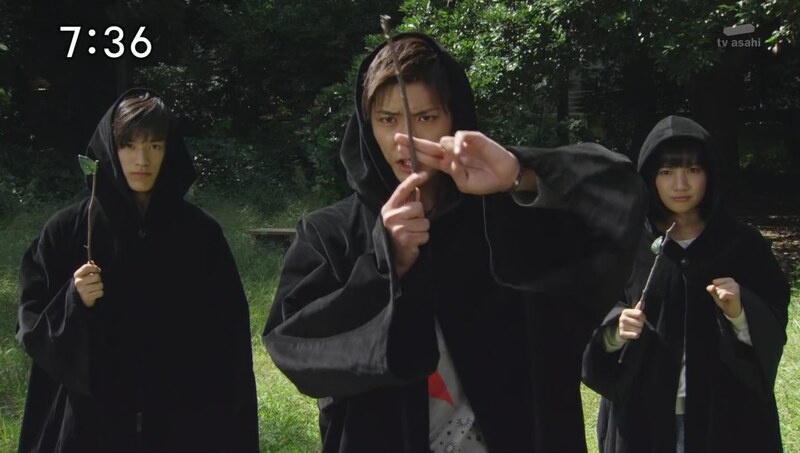 Back at the dojomanse, Tsubasa fixes Cloud’s wand and Takaharu’s Ichibantou. Cloud explains that Tsubasa-sensei taught him as a special lecturer. Tsubasa says that he just taught Cloud that courage is important. Elena asks when Cloud will return to England. But Cloud has something he wants to clear up with her first. He shows her the love note. She is flattered he still has it, but she has a boyfriend now and can’t marry her. The others giggle at Cloud getting dumped. But Elena says she thinks Cloud is even cooler as a ninja too. She kisses him on the cheek and the others giggle even more. Tsubasa henshins and summons his Sky Hokie broom to take Elena home. Anyway, Kasumi asks Yakumo if he’s chosen an outfit for their ceremony. Shishi-Oh says he just the right outfit. He pops on to Yakumo’s wrists and makes him go Chozetsu. At least, without the Ninninger suit on. 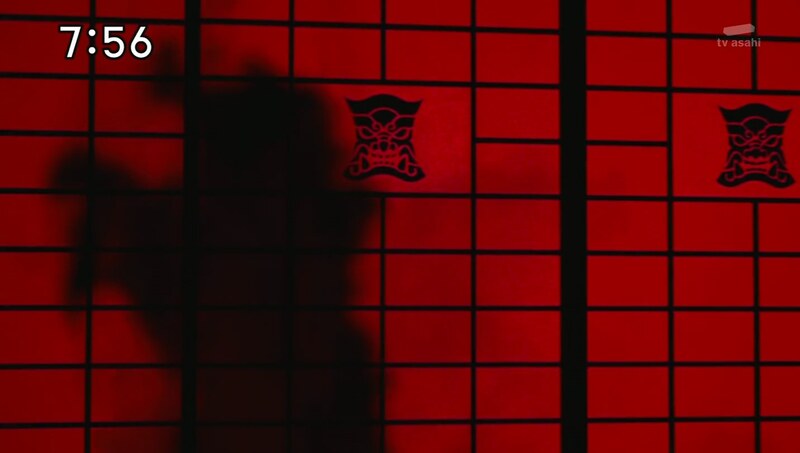 Meanwhile, Masakage watches as Ariake no Kata rises behind a screen. So, how do Yokai pregnancies work? Who’s the father?! We know Kibaoni Gengetsu isn’t around. Some soap opera intrigue there maybe lol. But really, this was an awkward episode even without the need for a Yokai Family Life lesson. A fun episode I guess, but still a little odd. It was fun to see Matsumoto Hiroya. But since I only know him as Jin from Go-Busters and not Tsubasa, this guest starring stint wasn’t as fanwanky to me as maybe it was for others who did watch Magiranger. But it was cool nontheless. 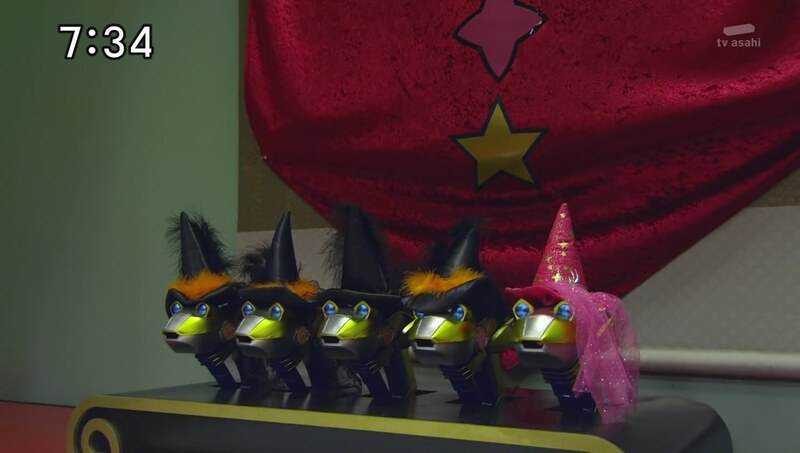 But the biggest thing that bothered me this episode was the Ninningers’ ages. 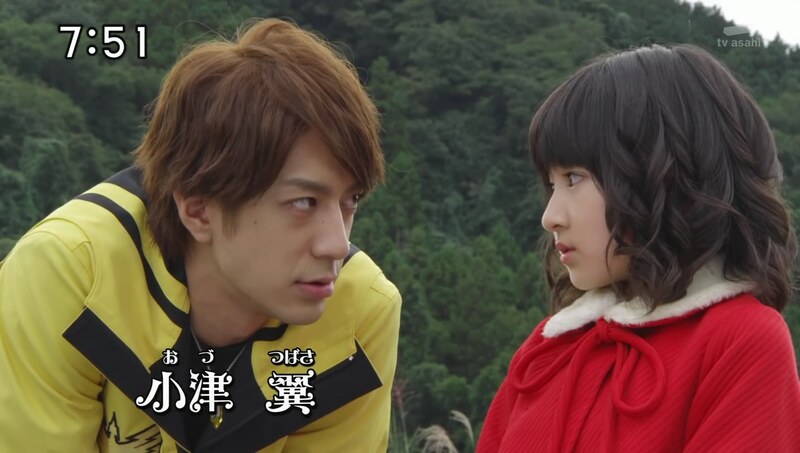 I thought Kasumi was the oldest, or at least the same age as Takaharu. But now she’s turning 20 the same time as Yakumo who calls her Neechan? (And also uses “Taka-nii” often.) Hmm… that actually really bothers me. Why change it when they made the age order pretty clear and obvious in the past. 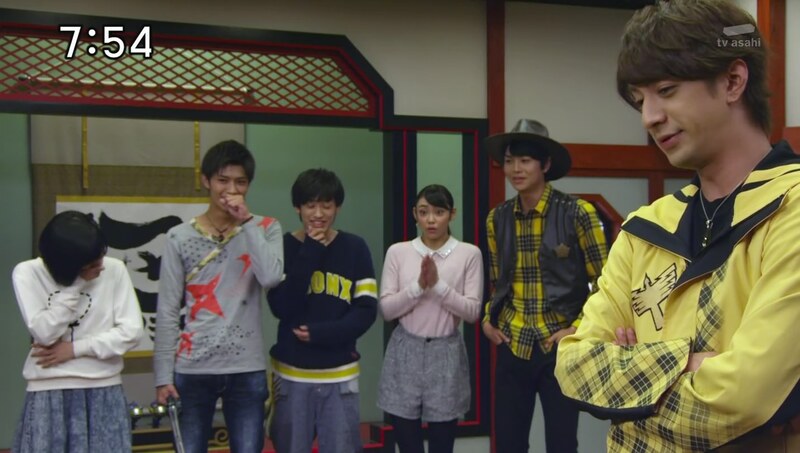 It’s also strange Fuuka didn’t know Takaharu already had his ceremony. Yes, he’s been away from home for a while. But she doesn’t know when he turns 20? Very odd. Since family is the biggest theme of this season, stuff like this, which are all really just minor details, really get to me. It feels off since their ages established the hierarchy of the cousins and plays a big part of each of their characters. Kasumi = Takaharu (with a little edge to Kasumi because she’s a “secret boss”) > Yakumo > Fuuka > Nagi. We can assume the Ninja Coming of Age Ceremony is not set in stone and supposed to only be in their birth month or something, but Yakumo was at least a year younger than Kasumi. Them doing the ceremony in the same month while Takaharu already “did” his last year, at the latest just doesn’t sit well with me. Anyway! Minor quibbles. But overall a fun filler episode. 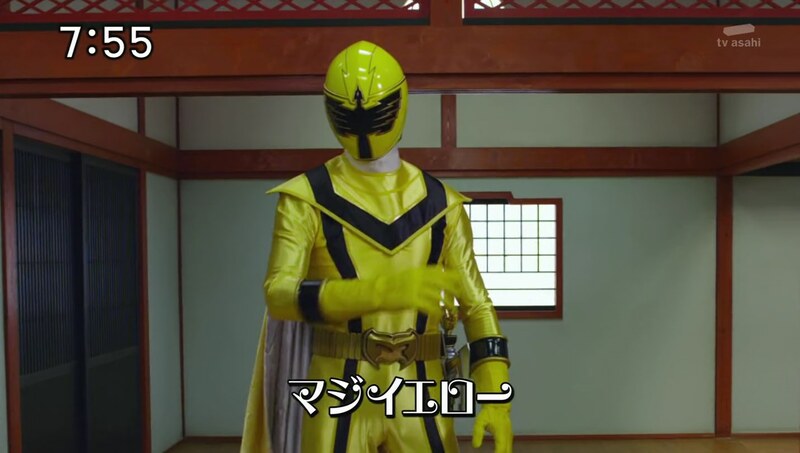 ← Recap: Power Rangers Dino Charge, Episode 18 – "You're definitely not the man who inspired me." I really hate how Yakumo is making england look, I like the magic he does but British men aren’t obsessed with lawn morrow and I dont think they accept women proposals, I’m guessing because I’m female. Yeah, it seems like a stereotype Japan must have of British men? It definitely gets exaggerated.